The casino was established in 2015 and is under the management of White Hat Gaming Limited. 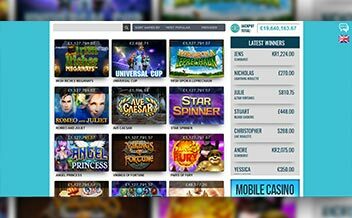 The casino offers a variety of casino games to cater for its ever growing client base. The casino has been licensed by Malta Gaming Authority and The United Kingdom Gambling Commission. Reel Island Casino has pride itself in ensuring that players get to enjoy a variety of casino games. 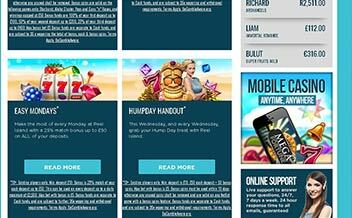 The casino offers 24/7 customer support on mobile and email and the support team is always ready to answer any queries. The casino offers a variety of banking options to cater for its vast client base. 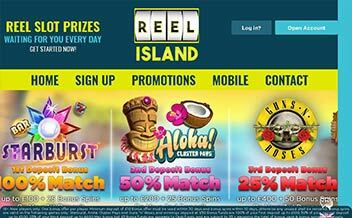 Reel Island Casino offers players a welcome bonus of a deposit amount of up to $100. This bonus has a wagering requirement of 35x before making any withdrawals. The casino also offers players everyday bonus, The Monday Blues Buster, The Tuesday Mystery Bonus on certain slot games, Break The Bank Wednesday on a selected number of games and the Tremendous Thursday. Reel Island Casino offers a variety of slot games from big names like NetEnt. The slot games have different themes to make the experience more fun. They include: Queen of the Nile, Choi San Doa, and Dolly Patron among others. Reel Islands Casino has not been left behind when it comes to live casino. Players are able to enjoy an almost actual casino experience while at home as they are able to chat with the live dealers who get to explain to them the rules of the games. These games include Live Baccarat, Live Blackjack and Live Roulette. 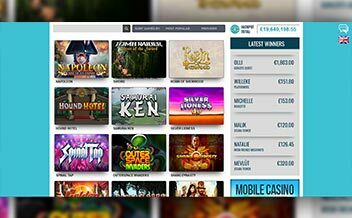 The casino has been powered by big names like NetEnt, NextGen, BetSoft, 1×2 Gaming, Aristrocrat, Amaya and Evolution Gaming among others. The casino has a user-friendly interface thanks to these software providers. Algeria, America Samoa, Angola, Australia, Belgium, Bolivia, Bulgaria, Denmark, France, Malta, Hungary, The United States, Turkey, United States Virgin Islands and Italy among others. PaySafe Card, Visa, Neteller, Skrill, Bank Transfer. Players get to access the casino games on web browsers like Chrome, Mozilla and Opera Mini. The casino also supports Android and iOS devices, the number of casino games on desktop version are more compared to the mobile version but they have amazing graphics. The casino has been always offering players a good experience and the bonuses are also impressive, the only thing they could work on is the payout speed. But in general it is a good casino and you should consider checking it out.